Allison writes, "We adopted Bear in January 2008 and after just over 10 months with him in our lives it is hard to imagine how we ever did without him. Marc and I still cannot believe how accurate his Foster Mom Lisa was when she told us what a cuddle bug he is. When he is not sharing a pillow or helping me on the computer, our sweet Bear Cat can usually be found in "his" chair, on top of the cabinets, or purring into a sleeping person's ear. 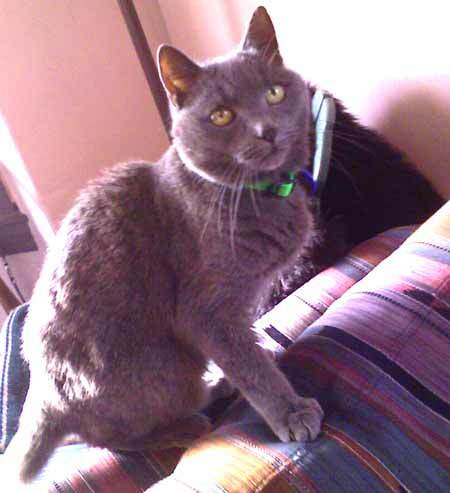 He is a constant source of joy and I am forever grateful to Kitty Angels for bringing us together." Dan, Wendy and Jake wrote, "We adopted Thumper on January 31, 2004. 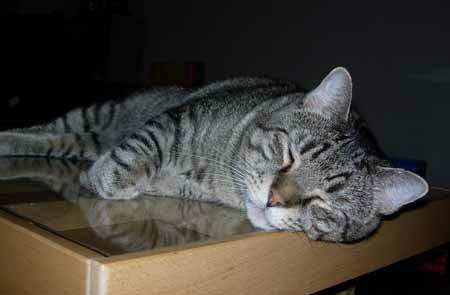 We had initially met him during a trip to PetSmart in the Fall of 2003. We fell in love with him instantly but at that time were unable to adopt another kitty. When we decided to adopt in January I contacted Kitty Angels to inquire about Thumper and was told that he had been adopted several weeks prior. Although disappointed we were still wanting to adopt a kitty into our home and decided to join the adoption day that Saturday to meet some of the other kitties. Several days later I received an email from a volunteer letting me know that Thumper's owner had contacted them and needed to return Thumper due to an unexpected job relocation which would not allow them to bring Thumper. We were elated!!!! We met Thumper for the second time on that Saturday and made him a member of our family immediately! 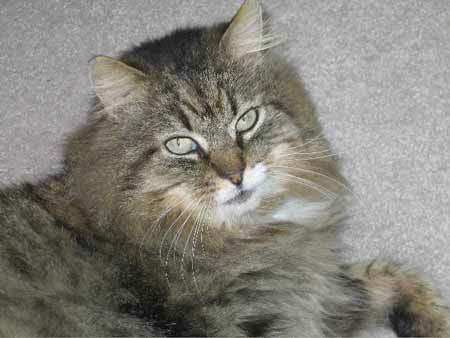 "Thumper was a delightful, sweet, and selfless kitty. He loved us all unconditionally. He was given his name by the volunteer who had found him in Lowell because each time she came to feed him he would "thump" his tail in delight against the ground making such a noise. He never asked for anything but love, pets, and kisses. He would sleep with our son every night and had always been his "protector" since the day he was born. He truly was a Kitty Angel! "Sadly, Thumper's life came to an end October 2, 2008. We knew we would not have him long due to his Feline HIV and that every day with him would truly be a blessing. In January 2007 he developed a large tumor in his abdomen. With some aggressive medication we were able to extend his life for nine months until he just got too tired to go on. We had to let him go. He made it so easy to love him but so difficult to let him go. Our family is not the same without him and we miss him more than anyone will ever know. "Thank you, Kitty Angels, for giving Thumper to us. He was meant to be ours and our home will not be the same. "We plan to open our home again to another kitty in need soon. We know Thumper would want us to give a home to another kitty in need as we did for him. "Thank you for all you do for our little angels." 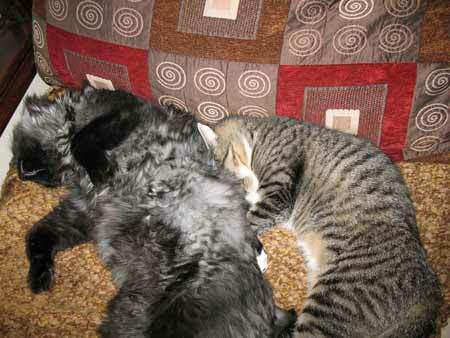 Jennifer writes, "In September 2007 we adopted Forrest and Rosie from Kitty Angels after losing our first beloved kitty to liver disease. Forrest was found wedged between two tree trunks and the local fire department had to use the jaws of life to free him. Rosie was found eating out of a trash can by a kitty angel volunteer who scooped her up and rescued her. The first week or so were tough and we weren't sure they were going to be able to get along. As you can see, they have worked out their differences! They are both sweet, loving cats." Jennifer writes, "Thank you for my wonderful new addition to my life... Dell! I adopted him in April 2008, and he is a wonderful kitty. "Dell loves to cuddle, in fact he is sitting in my lap as I write this email (making sure I am saying nice things I am sure). He also loves to have conversations with my boyfriend (yes the one who THOUGHT he did not want a cat) and will come when he is called. Obviously he is a very smart kitty. My boyfriend Cale and I love his company, and he really is the perfect fit for our lifestyle. "I hope this email makes you smile and finds you well... what your organization does is wonderful and the cats show the love that is given to them from you and your volunteers. I will be sure to keep in touch and let you know when I am ready for a brother or sister for Dell. Thank you again for helping Dell find me (he really did pick ME!)" Torrey adopted Moxie and Lola, and writes, "Just wanted to let you know the girls are doing great. i adopted them in October of 2004 but they were instantly a part of the family. They love to chase around each other or play catch with their fuzzy mice. They also have a big brother, Benny who also like to take care of his little sisters...but their favorite activity is to stand guard at the bird feeder window. 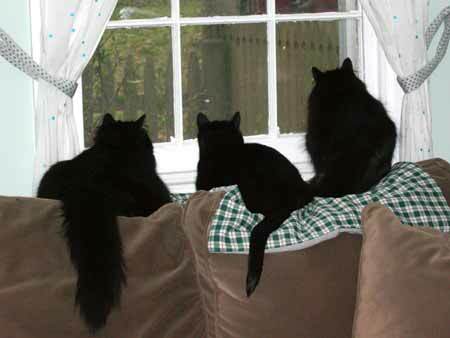 (Window picture: Benny, Lola and Moxie ) . Thank you!"